I know I am 90% - 100% lazy without even doing the test. It happens that I am even too lazy to get some food. I am too lazy to take the test, does that put me over 100%? Stewie, I was gonna say that. Except I was too lazy to. You're not lazy, maybe you have occasional moments, but you're doing your work, getting fitter. I guarantee that in a year your laziness score will be significantly lower. To get an image link without taking a new screenshot, copy the embed code and remove everything apart from the http://www.nerdtests.com/mq/badge/some_image.jpg text. 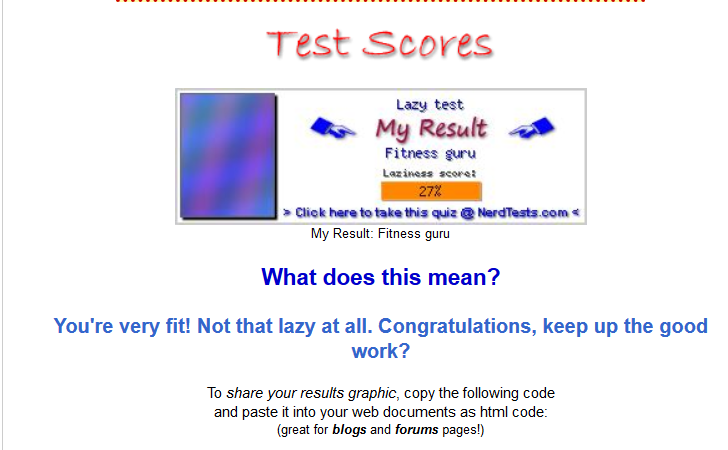 Why would a lazy person take a test to determine how lazy he is?